Since its beginnings in 1994, this company has grown to become one of New Zealand's favorite telecommunications providers, with around 200 employees providing internet, home phone and calling services to customers. Increased staff numbers and product offerings meant that it was important to find tools and techniques to ensure staff continued to be well informed and passionate about working for the company. The company has a particularly young workforce and a high percentage of call center staff and shift workers. In twelve months it also nearly doubled in size. All these factors presented a number of internal communications challenges. The high percentage of shift workers meant that it was difficult to gather staff into one place for business updates and news. Staff turnover rates in the call center were higher than in other parts of the organization. The average age of employees is 20 years old, meaning communications needed to appeal to a demographic used to engaging, entertaining and compelling media. Call center staff were being bombarded with between 50 and 100 emails per day. The company intranet was seen as ‘static’ and not updated often, hence usage rates and effectiveness were low. A new communications platform would be essential to increase staff engagement, reduce turnover rates, embed a fun culture, and measure communications effectiveness. The company wanted to find a communications solution that would appeal to its young workforce, who were used to dynamic, entertaining and attention-grabbing technologies. SnapComms offered the right combination of ‘fizz’ and solid business value. Screensavers are powerful visual tools for promoting company values, events and initiatives. A staff quiz can foster positive culture and test staff understanding of important business topics. Staff surveys provide an easy way for staff to anonymously submit their feedback or suggestions. 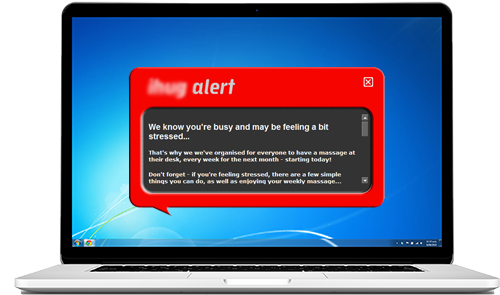 Desktop alerts ensure high impact for important messages, getting employee attention fast. Desktop tickers are short, punchy info updates scrolling across the bottom of computer screens. Animated screensavers were used to keep staff informed in a dynamic, non-intrusive way, including new product updates and promoting the company’s new knowledge base. A ‘Help our customers today’ promotion run on screensavers helped to focus staff on maintaining excellent customer service. Screensavers are also used extensively to promote employee benefits such as health checks, flu jabs, massages, fresh fruit, mobiles and broadband. Raising awareness of these additional staff benefits has helped employees feel valued. 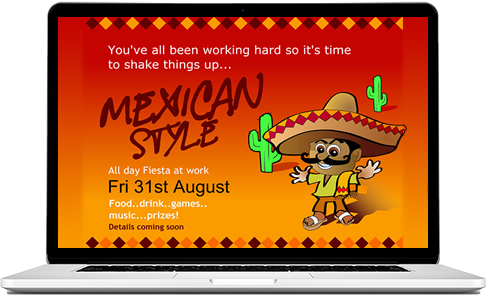 Fun staff events are also promoted via screensavers, including movie and quiz nights, staff awards nights, free coffee days and so on. The SnapComms Quiz tool was used to both build engagement and to reinforce key training and values. Examples include submitting the best cost-saving tip to win a prize, or fun ways to reduce stress. SnapComms Alerts are used whenever high message cut-through is needed. Examples of messages sent by alert include updating staff on key sales milestones and delivering the results of staff surveys. The ticker has been used to notify staff of email outages and to provide status updates. It has also been used for general business news updates, to promote special staff offers, and to promote training available. The survey tool has proved to be valuable for the company to quickly and easily gather feedback from staff and measure effectiveness in a number of areas, including the induction program for new employees. The SnapComms solution has helped this telco achieve all its communications objectives. The company now has a range of tools to communicate effectively with all staff, and they have been able to measure and improve the effectiveness of induction programs in order to bring new call center staff up to speed more quickly. Annabel Gould, Communications Manager, loves what SnapComms has given her because, "It's affordable, quick and simple to use, and the team at SnapComms have worked hard to customize the tools to suit us." The SnapComms tools have communicated the benefits of working for the company in dynamic, interactive and highly visible ways, helping to build engagement and reduce turnover rates. Click-through capability from the SnapComms tools has helped leverage the value of the intranet and reduce the reliance on emails, contributing to freeing up staff and minimizing email overload. “The SnapComms tools are fantastic for any company where staff are getting bogged down by too many emails,” believes Gould. We can't imagine a workplace without SnapComms tools now!